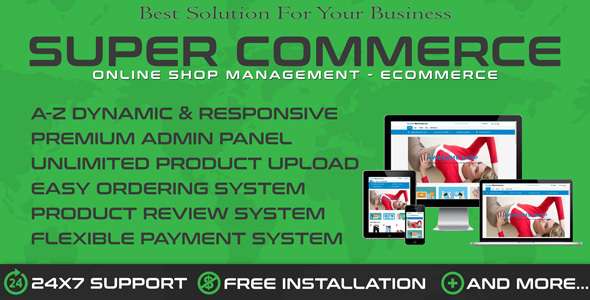 â€œSuperComâ€ Online Shopping Ecommerce Cart is designed feature rich, easy to use, search engine friendly and with a visually appealing interface. its simple, ready-to-use PHP Shopping Cart script for building dynamic online shopping store. SuperCom is a standalone shopping cart suited for selling and printing custom designed products. With our responsive e-commerce script, you will have your online store displayed correctly across a wide range of end-user devices and screen resolutions with easy ordering and checking out process. Nearly 25+ Features Included & More are comingâ€¦.